Because she spent five years as a mortgage loan officer and went to law school, Valerie is well-versed with a deep understanding of all aspects of the home buying transaction. She can explain each step in detail to a cautious seller who may not have sold a home in over twenty years or to an excited first time homebuyer who has no clue what to expect. Her past clients can tell you that Valerie genuinely cares about her clients and is not just out to ''make a deal happen.'' She is very straightforward and honest with you in helping you make decisions that are best for the financial future of you and your family. 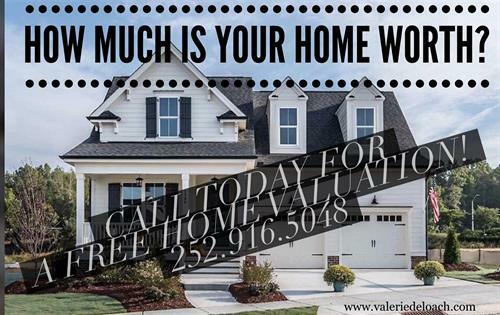 You will value her friendship through the process and well after closing! She truly cares about her clients!!! Valerie was born and raised in Greenville, NC and was a boarding student at Saint Mary's. She's a die hard Gamecock, but spends much of her time cheering on the Corinth Holders High School Varsity Boys and Girls teams, with kids on both teams. When not in the stands, she is performing her duties as the President of the Wendell Chamber of Commerce, a member of the Town of Wendell Economic Development Committee, and a member of the Wendell Falls Advisory Board. She always finds time for her committee positions at Wendell United Methodist Church. She married a Greenville boy, Joe DeLoach, who is her constant partner in crime and her biggest supporter. They have four amazing teenagers and two gorgeous golden retrievers. Although she has a lot on her plate, her family is still her number one hobby! My business is wherever I am!